College Football fans can watch live stream of the top SEC showdown every Saturday for free through CBSSports.com or through the CBSSports app. The SEC is annually a top conference in college football featuring top programs like Alabama, Georgia, Auburn, LSU, Florida, Tennessee, and a host of other top schools. CBS has been a broadcast partner of the SEC since 1996 and features a premiere SEC games each Saturday during the season in the 3:30PM ET broadcast window. As part of it’s deal with the SEC, CBS gets to air it’s choice of SEC games each week. All the CBS broadcast SEC College Football games are available to watch online either on your mobile or tablet through the CBS Sports app, or at CBSSports.com. 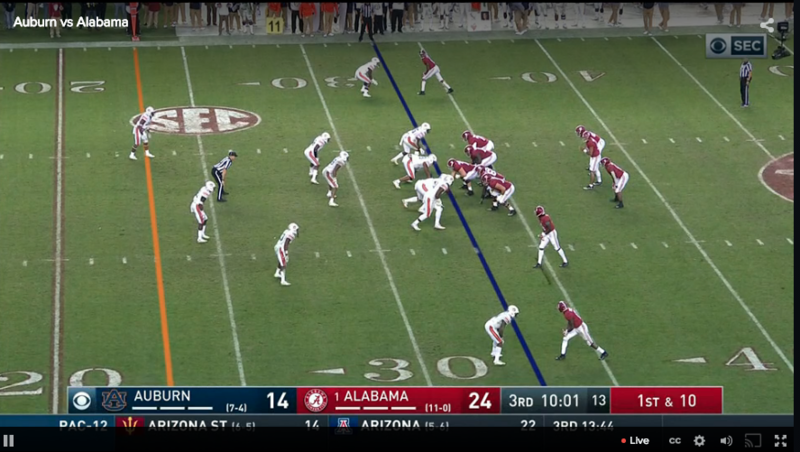 Both the CBS Sports App and CBSSports.com give you the ability to live stream either the “Main” TV broadcast video, or the “All-22” view, which gives you a larger view of the field and a better ability to see all the action. The CBS Sports browser version also includes live in-games stats. Even with the All-22, you still get the same audio call of the telecast. Currently, the broadcast team of Brad Nessler and Gary Danielson call the top SEC game each week. CBS games include not just the regular SEC season. The annual Army – Navy game and the 2018 SEC Championship game between #4 Georgia and #1 Alabama will also be live available to live stream. It’s pretty easy find available SEC games to live stream just by going to CBSSports.com. You can also go directly to the CBS Sports Live College Football stream. Both the mobile and desktop experience make a great way to live stream SEC football online and follow all the action through the SEC Championship game.